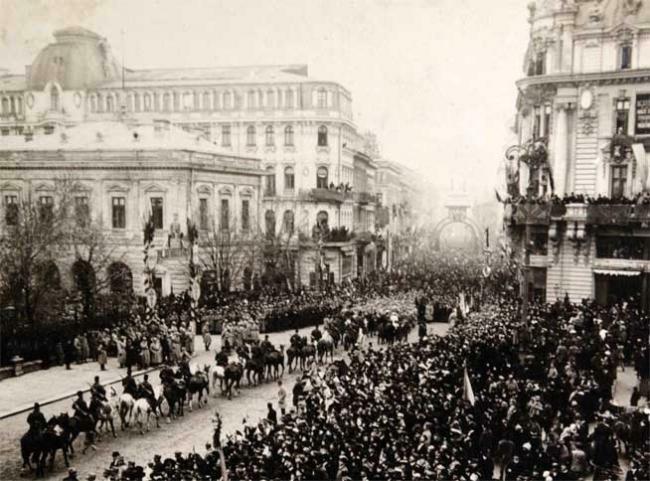 When the First World War ended on November 11, 1918, the Royal Family, the parliament and the rest of Romanians that were in exile in Iași returned to Bucharest two weeks after the cessation of hostilities. 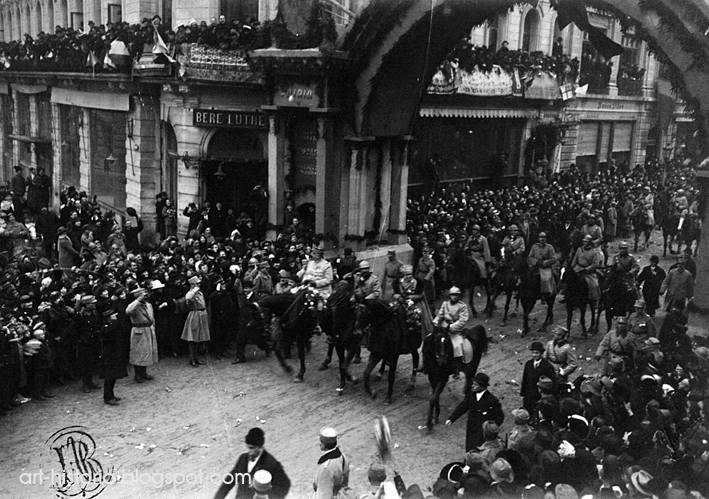 On December 1, 1918, King Ferdinand and Queen Marie were returning home- an exciting event not only for the exiles, but also for the inhabitants of Bucharest who, for more than a year and a half, had been under German occupation. Preparations were made and emotions ran high, as Queen Marie described in her diary. We have returned! We really came back after two years of exile. Moreover, we have returned- I can hardly say the word, but I still have to say it, because whatever is coming, it is true that on this day- we have returned triumphant! The end of a grand day, an extraordinary dizzying day, of unbridled enthusiasm. It’s great to say that everything went according to plan, though it was not easy to organize, because transport was a big problem, and torrential rains had worsened already poor conditions. However, I arrived on time. I was very impatient. I donned my uniform- I had to make myself a new tunic, with a somewhat English line, the form to which all the armies are now imperceptibly striving. Barbu lent me his sword belt and a scarf which he tied it with his own hands as a final note. I had a grey astrakhan hat on my head, caught with a strap under my chin. It gave me a strange youthful air, making me look boyish and plump. Over them, I had a long, double jacket. I am describing all of this because one day I am going to amuse myself and others remembering what costume I had when I arrived in the capital. I rode on the formidable Jumbo, which is enormous, tall and strong and almost indifferent to noises and excitement. At the Mogoşoaia railway station, Berthelot, Rosetti and other French officers were waiting, alongside Prezan, some other Romanian generals, Catargi with his family and all my chaperons- a very moving encounter. I had great luck. Yesterday poured all day and throughout the night while I was on the train, but today it cleared, although there was no sun, it was not cold either. I, Nando, Nicholas, Berthelot, and all the other important people climbed on their horses at the train station. You had to jump a meter in the air to climb on Jumbo, but once you’re in the saddle, you had a strong sense of well-being and calm. He is a very solid animal, and this morning he gave me the advantage that, being at a height, I had a splendid overview. On the full length of our dear and old road all the soldiers were lined up on one side and the other, first the French, then the English, then the Romanians- the first of them were from my regiment. I cannot describe properly how much the sight of the allied troops touched me! It was clear proof that our sorrows came to an end, we finally saw friends- we had not seen allied troops apart from the Russians, and those, alas, we know very well what kind of allies they had been! In the second rotunda we were met by priests and they held a brief religious service and blessed the flag. Immediately before entering the city, our mayor received us with the traditional bread and salt together with a whole diplomatic corps and the current and former ministers of the country. The march on a beautiful adorned Victory Avenue followed- I can only describe it as a triumphal march, at the front of our troops, followed by allied soldiers. The city simply went mad. It seemed to me that even the houses, the streets and the pavement stones cried, acclaimed and enjoyed together with the crowd. I passed on horseback through a sea of deafening cheers. Flags everywhere, people crowded at every window, on every roof, not to mention the street. I was walking to Nando’s left, Nicholas was on my other side, and Berthelot was on Nando’s right. Carol was leading his regiment, my girls had gone beforehand, in an open carriage, with four black Russian horses. The whole city was delirious. We had been gone for two years, we had known all the horrors of the occupation with everything it had brought, and now we were returning victorious, despite the misfortunes, we were returning after we had fulfilled the Dream of Ages, the Golden Dream of Romania. We were returning with Greater Romania- we were returning as king and queen of all Romanians. It’s almost unbelievable, but it’s true! Our procession went up to the classic square next to the statue of Michael the Brave, where every year, on May 10, parades were held; we stopped there, and all the troops passed in front of us. It is hard to describe the frenetic excitement of the entire population. They were just maddened by happiness, and they voiced so much joy that you were afraid that they would die of effort. After the parade I dismounted and I went by carriage to the Metropolitan Church- Nando and I were in an open carriage. At the Metropolitan Church, while we were waiting for the others to come, I had ten minutes to get out of military equipment and change myself into a royal robe dress with golden and sable embroidery, with a small golden lace collar. The church ceremony was short and solemn, in the old and dear church, that was dimly lit, only by candles, which in the churches give a much more pleasant effect than electricity. There was a weird satisfaction when I watched the church full of French and English officers. It was wonderful, I thanked God from the deep of my heart. At the end of the ceremony, Grigorescu asked Nando, in the name of the army, to accept the rank of Field Marshal. Nando was very moved and very happy. Then I left in an open car for Cotroceni! For Cotroceni! This was the moment I was afraid of. That was where all my longing had been in these two troubled and tragic years- there, at the old church, where the little tomb had barely been closed when we left. We returned to you, Mircea, my little one, after two years- I, who had fled, a mother with a broken heart and a defeated queen, I returned victorious, it seems that I AM ONE OF THE VICTORS! But you are dead, Mircea, my little one, neither the joy nor our pain will touch you in any way; so many people died in the whole world who cannot enjoy the moment of victory- but they also haven’t endured the suffering of the living! The dear, dimly lit church was so quiet; the priest received us in silence, but with tears in his eyes. I kneeled near your grave, Mircea- I do not know if I prayed, but I remembered, my little one, I remembered everything, everything with the whole of my heart. The old servants, Steinbach, Berkan, Kirila, Pinoşanu, Fortuna, etc. welcomed us. The German servants, because they behaved in a shameful manner, must have fled. The house looked huge- nothing was broken, though, of course, it was quite a mess, but much less than I would have thought. The return was odd, but in some ways totally natural; now that we have returned, it was as if we had never been gone that much. We had lunch with our “retinue” in the new salon that was so dear to me which I had so discreetly decorated. The furniture was moved to its place, but for the most part it’s still here. It was strange and pleasant to eat again from elegant porcelain plates with beautiful flowers on the table and to drink from delicate glasses. After lunch, I left with Nando into town with the car, to see the big palace. The whole city was in the street. I visited old Burin, who has endured the whole tragedy amazingly well, she even looks younger. We went to see the preparations for a large feast and we were pleased- great efforts were made in these hard times, but you would not even have thought we were just coming back. I went home alone. The car could barely pass through the streets full of boiling crowds, driven by a fanatical enthusiasm. People were climbing on the car, we were hardly moving, it was touching, comical but somewhat dangerous. Once home, I rested a little, taking the wise decision not to take charge of the rooms yet, because I knew the festive dinner would drain me off all the energy I had left. I dress as stylishly as possible, but, having no jewellery, I cannot give myself those last finishing touches that undoubtedly increase the dignity of a queen. All my jewels are- or are not! – still in Moscow, I may not see them again. I have no news from Boyle. I thought a lot about him today and I wanted him to share with us the triumph of this day. He would have been so glad for me. I also thought of Filipescu, who was not to see this great day he had dreamed of with so much excitement. At dinner, in the grand ballroom of the palace, there were about 120 people. Allied ministers, past and present ministers of Romania, foreign officers, Bukovinians, etc. Nando made a very beautiful and worthy speech. It is true that the subject was easy and pleasant. After that, conversations with a lot of people, coming back home and a well-deserved rest. I slept in my dear silver room, surrounded by all the things I once liked.